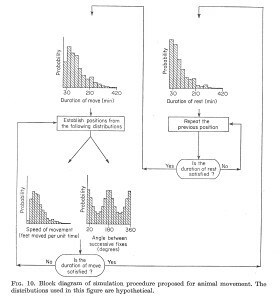 The program I eventually wrote was based on FORTRAN code that had been printed as an appendix to ecologist Donald B. Siniff’s dissertation, “A Simulation Model of Animal Movement Data,” which he submitted to the University of Minnesota in 1967. 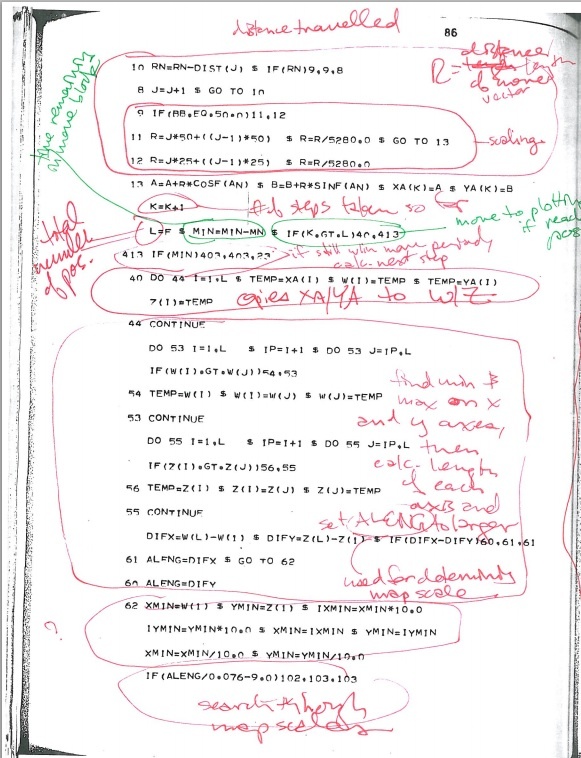 This code was my first time encountering FORTRAN, and there were some complications, beginning with the challenge of learning to read a programming language that looked somewhat different from those I was (or at one point had been) familiar with — namely BASIC, C, Lisp, and Python. If you know FORTRAN, it’s pretty straightforward — a few simple calculations, comparisons, and control of the program’s flow. But there was virtually no documentation or in-code commenting for Siniff’s program, and it took me a while to figure out precisely how each statement worked and what the overall logic was. 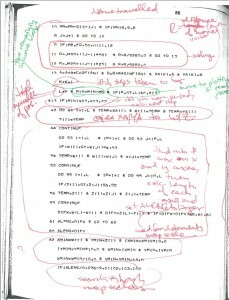 I got some help figuring out the FORTRAN part from old Control Data Corporation programming manuals scanned as part of the bitsavers collection hosted at the University of Stuttgart. The biggest challenge, however, was simply to understand code written by somebody else a long time ago for his or her own purposes. In this case, the challenge was exacerbated by the use of a tangled web of “go to” statements rather than subroutines, which was typical for the time but which makes it harder to see the program’s logic. After wrestling with this code, using a more recent language like Python felt a breath of fresh air. 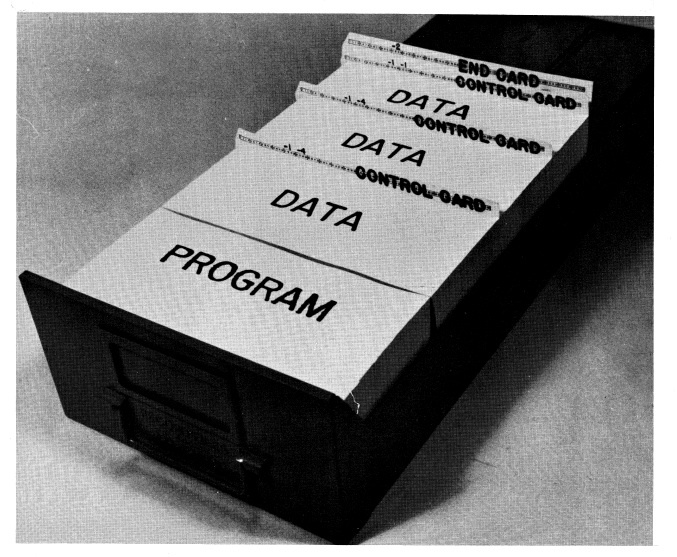 And to imagine that the FORTRAN code had to be punched onto cards before it could be run and tested! I’ve scanned in two versions of the original code: a clean version just as it appears in the printed-out microfilm copy of Siniff’s dissertation that I received through Inter-Library Loan (thanks to the fantastic librarians at the Max Planck Institute for the History of Science), and a photocopy of the print-out that I marked up with a pen during a few successive commutes on Berlin’s S-Bahn. This is probably the right time to mention that when I told Siniff that I was re-creating his program from 1967, he seemed both mystified and a little embarrassed. He assured me that the version of the program in the dissertation had serious flaws that he was only able to correct in a later version. Nothing I say here about the difficulty of understanding the code should be taken as a judgment of the quality of Siniff’s work; on the contrary, this little project is partly meant to be a (geeky and perhaps misguided) sign of respect for a pioneering piece of work. Another challenge was getting used to an event-driven programming style that was necessary for making the simulation into a web app — that is, a style where the program runs by “listening” for the user to do things like click a button or enter a new value into a text field, rather than following a pre-determined execution order. I also struggled to get the aesthetics of the graphical output right using the HTML5 Canvas element. In retrospect, the controls, event listeners and plotting were simple enough, but I made a lot of small errors along the way that compounded into major headaches. 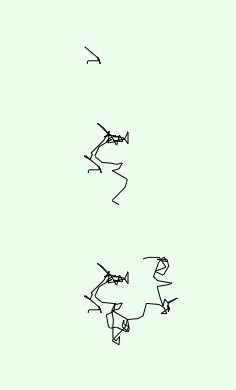 Once I had the thing running and generating outputs that resembled the illustrations in Siniff’s dissertation, I kept seeing areas where I could add a new feature and getting sucked back into the code. Some of these updates were minor (and not particularly faithful to the original), like making it possible to change the colors of the plot; some of them actually made the simulation more interesting. 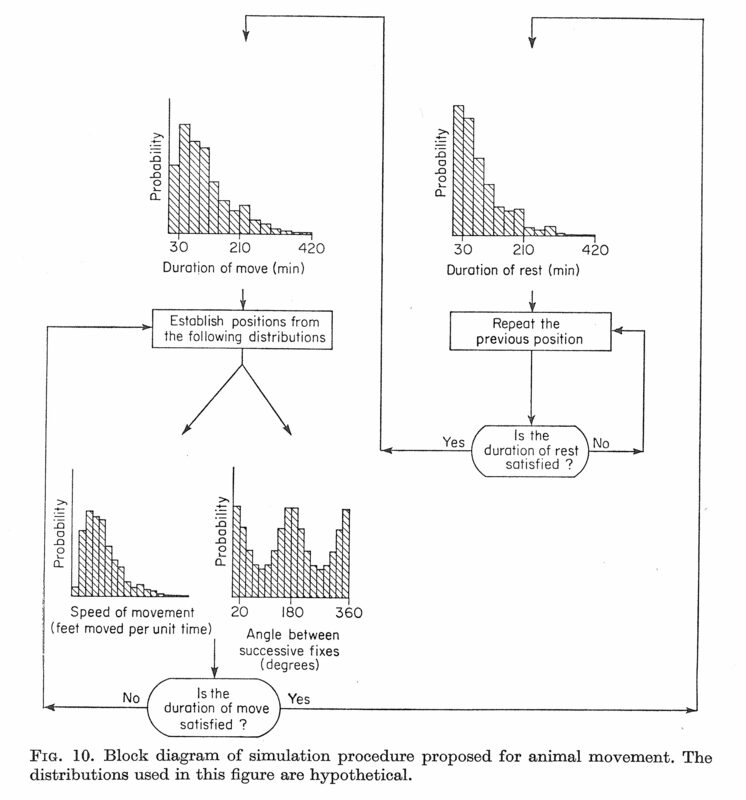 The most significant of these was the ability to select different distributions for the angle at which the simulated “animal” would turn at each step. This was one of the major focuses of Siniff’s work, and to leave it out, I thought, would be seriously undermining the value of the re-enactment, such as it was. Once you’ve been deeply immersed in building a program for a while, it becomes almost impossible to imagine how someone who hasn’t been similarly immersed will encounter it. After showing an early draft of the program to a friend, I realized that even though it was completely obvious to me what was going on when a simulation was plotted, it wasn’t going to be obvious to someone coming to the program without prior knowledge. I had set up the program to draw the whole simulation instantaneously, so it was hard to see that it was actually a path that was being traced out. It just looked like a static pattern — there was no movement in the animal movement simulation. This was faithful to the original, since Siniff had received his results as finished plots, but it undermined the impact of the re-enactment. 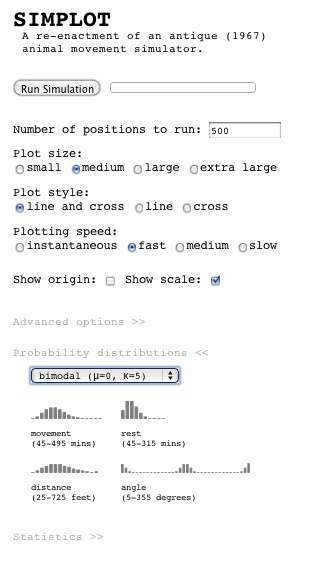 Adding the option of plotting at different speeds, with a progress bar showing how far through the simulation the plot had progressed, wasn’t quite as difficult as adding a choice of probability distributions, but it also took some time. I think I still prefer seeing the patterns plotted without any delay, but the fact that you can see it plotted out step-by-step is crucial.